The area included in the implementation of agri-environmental measures has been strongly increased after 1999 and in 2008 covered 323,043 ha (gross), or 247,420 ha (net). The share of area with one or several agri-environmental measures (net) in the period 1999-2008 has increased from 0.6 % to 50.2 % of all utilised agricultural area. The indicator presents the area included in the implementation of agri-environmental measures in Slovenia and the EU in the period 1999-2008. It shows area which obtained support for the implementation of individual environmental measures in line with the regulations on the implementation of agricultural policy in a particular year. Since many different agri-environmental measures can be implemented on one and the same area, the basic information is the gross area. The relative aggregate indicator is the share of area subject to these measures in the total utilised agricultural area. In calculating the relative indicator, data on net area is used (without doubling those where several measures are being applied), which is comparable with the definition used for calculating the indicator within the EU. This indicator does not provide direct information on the environmental efficiency of measures. It shows, however, the response of agricultural holdings to agricultural policy supporting the environment-friendly production methods. The measures of agri-environmental programmes with various forms of support encourage the preservation or transition to more environment-friendly ways of production, thus improving the quality of soil and water, preserving the fertility of soil, biodiversity, the traditional farm landscape, and thus also sustainable use of natural sources. Farmers join the programme on a voluntary basis, and implement measures on one part or the entire farm holding. They sign a special agreement undertaking to run the production within a minimum period of time (five years as a rule) in line with the conditions prescribed for individual measures requiring more than just respecting the usual principles of good agricultural practice. By joining the agri-environmental programme, they are entitled to direct payments to cover additional costs, or compensate the loss of income due to a more demanding farming method. Agricultural policy started to apply the first measures to support the environment-friendly ways of production in 1999, and to a large extent after the adoption of the Slovenian agri-environmental programme in 2001. In the first year (2001), ten measures were implemented, and in the following years their number increased to more than 20. After joining the EU in 2004, the support under agri-environmental programme became part of the Rural Development Programme of the Republic of Slovenia. Area under agri-environmental commitment has been increasing after 1999. In 1999, these measures were implemented on 2,948 ha, and in 2008 on 323,043 ha. Area was increasing along with the increasing number of measures, and following a growing response to individual measures. The largest increase concerned area with the measures to reduce negative impacts of farming on the quality of soil and water (integrated production, greening of arable land, crop rotation), and the area with organic farming. The increase of area under measures for preserving the landscape, the habitats, and the biodiversity was rather modest, although these measures still hold the largest share of gross area subject to agri-environmental measures (50% in 2008). 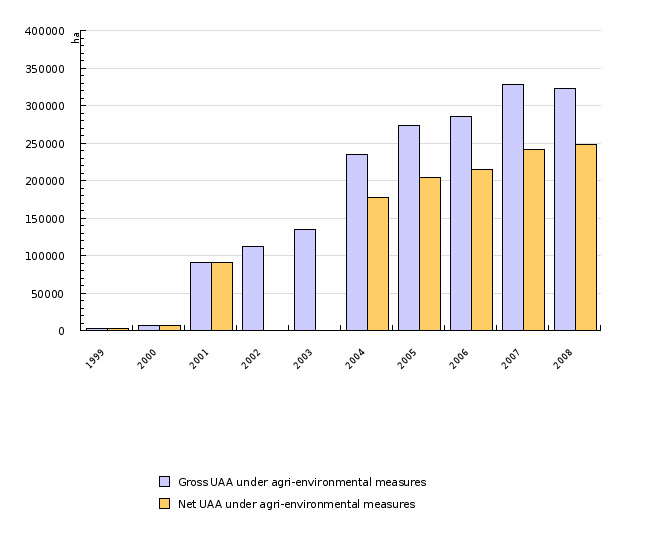 The share of utilised agricultural area with at least one agri-environmental measure (net area) has increased from 0.6 % in 1999 to 50.2 % in 2008. Comparison with data for the EU Member States shows that the share of area under agri-environmental commitment in Slovenia is rather high, but much lower than for example in Austria, Sweden, Finland and Luxemburg where it exceeded 80% back in 2002. Source database or source: Data on the approved and paid support for individual agri-environmental measures and area concerned by these payments are managed by the Agency of the Republic of Slovenia for Agricultural Markets and Rural Development (ARSCTRP). They are published within the framework of annual Reports on the situation in agriculture, forestry and food by individual year (Ministry of Agriculture, Forestry and Food). Reports are available on the web site of the Agricultural Institute of Slovenia. Data on utilised agricultural area are collected and published by the Statistical office of the Republic of Slovenia (SORS) on its portal SI-STAT (Environment and natural resources > Agriculture and Fishing > Crop Production > Crops and Area > Land use and use of arable crops (ha)). Methodology and frequency of data collection for the indicator: Data on area which received support for implementing the agri-environmental measures are part of the system for applying the agricultural policy measures. The original data are being updated on-line upon each payment of the approved application. Information on area under agri-environmental commitment for each particular year is a cross section of the situation on a particular date in the second half of the following year when most payments for the measures implemented in the previous year have already been carried out. Data processing methodology:The total area included in agri-environmental measures is calculated as a sum of area subject to individual basic measures. Information on net area, i.e. area which is considered only once if several agri-environmental measures are being implemented on the same area, has been taken directly from MAFF annual reports. This information is not available for all years and in terms of methodology not completely comparable with the information on gross area. The relative indicator is calculated by dividing net area with the total utilised agricultural area (net area under agri-environmental commitment/UAA x 100). In calculating the structure of gross area under agri-environmental commitment, individual measures are assembled in groups in line with the methodology used in the EU under the indicator IRENA 01. Data from administrative sources are not systematically and regularly publicly available. Certain reports may quote somewhat different data, but these do not differ so as to have any impact on the reliability indicator. Reliability of the indicator (archival data): The indicator is sufficiently reliable. Source database or source: Data on the share of utilised agricultural area where at least one agri-environmental measure has been applied are collected up to 2002 for all the EU-15 countries within the framework of the indicator IRENA 01 (Area under agri-environment support). 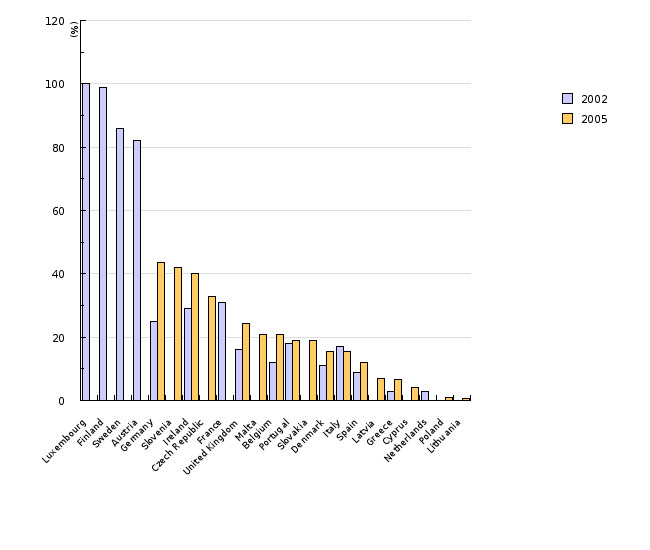 For the period from 2001 on, data on the share by individual Member States are available in EUROSTAT databases (Statistics Database > Statistics > Main tables > Environment and energy > Environment > Area under agri-environmental commitment (%)). Methodology and frequency of data collection for the indicator: Data on area refer to the concluded agreements on applying the agri-environmental measures. Data are supplied by Member States once in a year. - Advantages and disadvantages of the indicator: data are available with delay (the last ones refer to 2005) and do not include all EU Member States. Reliability of the indicator (archival data): The indicator is relatively reliable. - European Environmental Agency, 2005. IRENA Indicator Fact Sheet 01: Area under agri-environment support.